As a child, Bart King discovered he could punch people into outer space. Sadly, he lost a lot of friends that way. Today, Bart is one of the world's most in-demand superhero experts. So if you're wondering if you have what it takes to be a superhero--of course you do! All you need is a burning desire to fight evildoers. Oh, and also a secret identity, the perfect name, a cool costume, some terrific superpowers, and an archenemy. Actually, you know what? You better get this book! This hilarious book even tells you how to become a supergenius! (We'd explain it here, but you wouldn't understand--yet!) 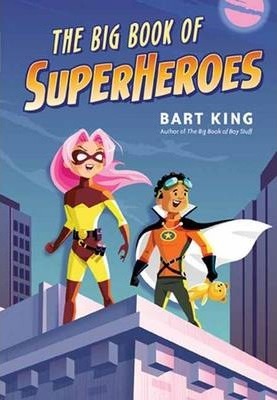 In these pages, you will snicker at superhero humor, snort at the Ten Lamest Superpowers, or just sneeze if you're allergic to its superawesomeness.